For optimal protection in the event of a crash, all passengers must be seated and wearing adequate restraint systems. This is even more important for children. According to 2003/20/EC Directive, this prescription is compulsory for all European Community countries. Compared with adults, their head is proportionally larger and heavier than the rest of the body, while the muscles and bone structure are not completely developed. Therefore, correct restraint systems are necessary, other then adult seat belts. The results of research on the best child restraint systems are contained in the European Standard ECER44. As it may be noted, the groups overlap partly and in fact, in commerce it is possible to find devices that cover more than one weight group. All restraint devices must bear the certification data, together with the control brand, on a solidly fixed label which must absolutely never be removed. Over 1.50 m in height from the point of view of restraint systems, children are considered as adults and wear the seat belts normally. Lineaccessori Fiat offers seats for each weight group. These seats are the recommended choice, as they have been designed and experimented specifically for Fiat cars. place cradle child’s seats on the front passenger seat of cars fitted with passenger’s air bag since the air bag could cause serious injuries, even mortal. You are advised to carry children always on the rear seat, as this is the most protected position in the case of a crash. In any case, children’s seats must absolutely not be fitted on the front seat of cars with passenger’s air bag, which during inflation could cause serious injury, even mortal, regardless of the seriousness of the crash that triggered it. make sure that deactivation has actually taken place (see paragraph “Front and side air bags” at item “Front passenger’s air bag”). The front passenger’s seat shall be adjusted in the most backward position to prevent any contact between child’s seat and dashboard. Babies up to 13 kg must be carried facing backwards on a cradle seat, which, supporting the head, does not induce stress on the neck in the event of sharp deceleration. 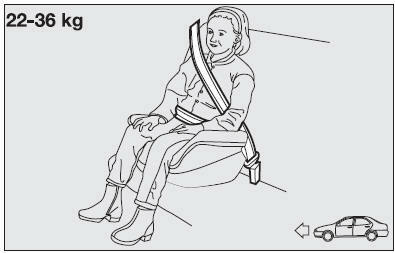 The cradle is restrained by the car seat belts, as shown in the figure and in turn it must restrain the child with its own belts. Starting from 9 kg to 18 kg in weight, children may be carried facing forwards, with seats fitted with front cushion, through which the car seat belt restrains both child and seat. for assembly only. The seat should be installed following the instructions that must accompany it. suitable for covering weight groups 0 and 1 with a rear connection and their own belts to restrain the child. Due to their size, they can be dangerous if installed incorrectly fastened to the car belts with a cushion. Carefully follow the instructions for installation provided with the seat. Starting from 15 kg to 25 kg in weight, children may be restrained directly by the car belts. The only function of the seat is to position the child correctly in relation to the belts, so that the diagonal part adheres to the chest and not to the neck and that the horizontal part clings to the child’s pelvis and not the abdomen. For children from 22 kg up to 36 kg the size of the child’s chest no longer requires a support to space the child’s back from the seat back. The figure shows proper child seat positioning on the rear seat. Children taller than 1.50 m can wear seat belts like adults. example for mounting. Attain to the instructions for fastening which must be enclosed with the specific child restraint system you are using. Key: U = suitable for child restraint systems of the “Universal” category, according to European Standard ECE-R44 for the specified “Groups”. (*) = in correspondence with the central place of the rear seat with lap belts (without reel), no type of seat can be assembled. The recommended position for installing child’s seat is on the rear seat, as it is the most protected in the case of a crash. cluster to make sure that it has actually been deactivated. Attain to the instructions for fastening the specific child restraint system which you are using. These instructions must be provided by the manufacturer. Keep the child restraint system installation instructions with the car documents and this Handbook. 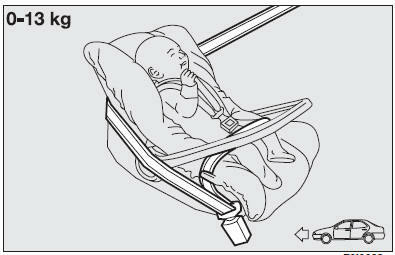 Never use a child restraint system without installation instructions. Always check the seat belt is well fastened by pulling the webbing. Only one child is to be strapped to each retaining system. Always check the seat belts do not fit around the child’s throat. 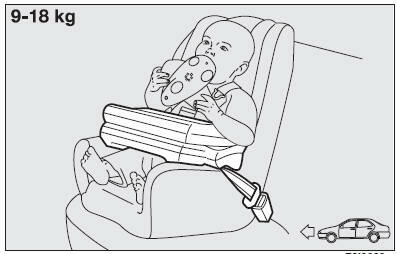 While travelling, do not let the child sit incorrectly or release the belts. Passengers should never carry children on their laps. No-one, however strong they are, can hold a child in the event of a crash. In case of an accident, replace the seat with a new one. passenger air bag never place child’s restraint systems on the front seat since children shall never be seated on the front passenger seat.